Serving Colorado Businesses, Organizations, & Events, with digital marketing services since 1999. Colorado Promotion provides professional digital marketing services including website design, website hosting, ecommerce, & social media consulting. Since 1999, we strive to achieve one overall goal when it comes to marketing businesses, organizations, and events via the internet: provide professional quality design services, at affordable cost. No two businesses, organizations, or events are alike. Each entity has its own unique target market of customers, competition, geography, and more. We design and plan web marketing to your individual business/organization needs. In Colorado? 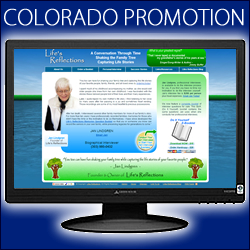 Colorado Promotion offers a variety of unique marketing avenues beyond traditional website design services. Simply, discover how we can plug your business, organization, or event, into our expansive network of local Colorado targeted marketing opportunities. Contact Us.